The head of the Crown Prosecution Service in Wales says he wants to see more prosecutions of people who commit crimes against older people. Of the 35,000 crimes prosecuted in Wales last year, just 250 were against older people. Mr Hughes said about 84% of reported cases had a conviction, but “a tranche of crimes” never made it to court. “That may be because some older people don’t want to report crime, that they don’t believe they will be taken seriously or feel that it might make things worse for them,” he added. The CPS is opening its books on four cases involving older victims on Monday at its first area scrutiny panel on the issue in England and Wales. It wants feedback from different organisations on how they prosecuted them. Mr Hughes said he accepted older people could be patronised or stereotyped as all being vulnerable, but they wanted to learn lessons so more people would have the confidence to report crimes. 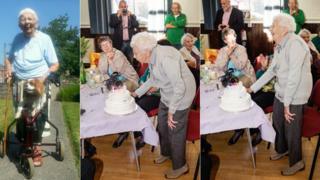 Joanne Davies, 94, needed a carer to help her wash and dress at her home in Bridgend. But a young woman who turned up at her door one Saturday in June – by chance – was a fraudster and burglar. Playing the part, the woman offered to make Joanne a cup of tea, and helped her into the shower before ransacking her home. Police were called after the real carer arrived and her son said the response was “fantastic” and proceeded at a pace which was comfortable for his mother. “There was a quiet confidence that they were going to get this person. And they did it very quickly,” he said. Abigail Hanford, 28, was jailed for three years and eight months for what police called a “cruel, cold-hearted crime”. Peter praised the “humanity” in the court process, but said there needed to be a service to step in afterwards. 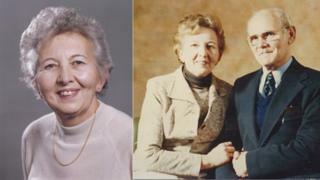 He said his mother, now 95, had been “fiercely independent” and had to come to terms with people helping to care for her. “She coped awfully well initially – she’s a very strong, resilient and kind woman,” he said. “But as time went on, after the court proceedings, then she had more time to think about it, and the anxiety and feelings of paranoia kicked in. “She became very anxious and also developed an infection, had another fall and broke her pelvis and hip bone and elbow. 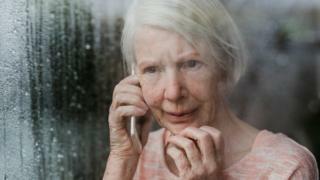 Older people can be targeted for distraction burglaries as well as online and text scams. There is also “cuckooing,” with criminals befriending an elderly person and using their home as a base for illegal activities. Trading Standards found older victims were two-and-a-half times more likely to die or end up in a care home within a year of a crime. Prof John Williams, of Aberystwyth University, who is involved in the Dewis Choice research project, said after the age of 60 in the criminal justice system there “was a tendency for things to be done to you rather than with you”. “It may be well intentioned but it is ageist,” he said.